While she has not yet announced she is running for the GOP nomination for president, former Hewlett-Packard CEO Carly Fiorina looks more like a candidate every day. On Thursday at a breakfast sponsored by the Christian Science Monitor, Fiorina threw yet another barb at Hillary Clinton, who announced her candidacy for the Democratic nomination on Sunday. Fiorina said if Clinton faced a female opponent, "there are a whole set of things she won't be able to talk about," The Monitor reported. "She won't be able to play the gender card." Pretty standard stump speech rhetoric there. But about halfway through the breakfast, according to The Washington Post, a reporter from The Washington Examiner made a remark that brought things momentarily to a screeching halt: "Well, ma’am, I never met a presidential candidate with pink nail polish on." According to The Post, Fiorina retorted there was "a first time for everything," but said nothing about nail polish in her reply. Instead, she focused on the second part of the reporter's question, which asked how she would deal with women's issues. 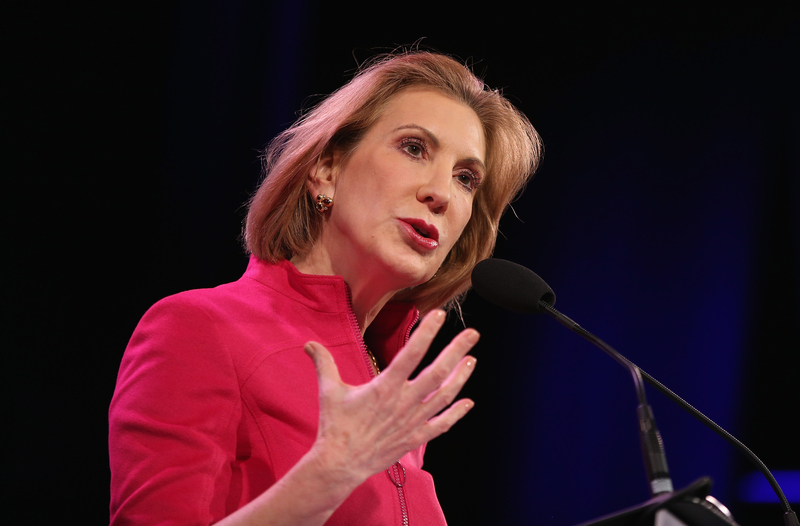 In essence, Fiorina said "Every issue’s a women’s issue." I’ve been dealing with it all my life ... sometimes you choose to confront, and sometimes you choose to ignore it and just keep going. This is where I'm going to respectfully disagree with Fiorina, because unless reporters and others in high-profile positions are called out for those kinds of remarks, it won't stop. They might keep making comments aimed at female candidates' appearance anyway, but until and unless the response to those comments changes, until women and men both push back on those kinds of seemingly innocuous remarks, it will be that much more difficult to have a dialogue about any issues, women's or otherwise. While every issue might be a women's issue, there are some issues that will remain only women's issues until we can convey why men should care about them, too. It is not OK to make a comment about a woman's appearance in a professional setting. My first impulse if a man had made that comment to me would have been to extend one finger (and fingernail) in his direction to give him a better look at the nail polish. But, given that it was a professional setting, I'd like to think I would have called him out for making such an out-of-context comment. "There are a lot of things you've never seen in a presidential candidate, but you'd never remark about a man's physical qualities in that way. We might never have had a president with green eyes or who was left-handed before. What difference does that make? Unless we're talking about everyone's fashion choices, I'm not interested in your opinion about my nail polish." If the reporter who pointed out Fiorina's nail color asked Marco Rubio about his shirt and tie color coordination, or asked Ron Paul who styles his hair, then fine. We're all on the same page. But ignoring the double standard of mentioning the appearance of a woman in the public eye won't make that double standard go away. Just ask Carly Fiorina. She's been dealing with it her entire life.